Spark-Y hosts an annual internship every summer for youth around the country to gain real-world sustainable experiences through community partnerships. 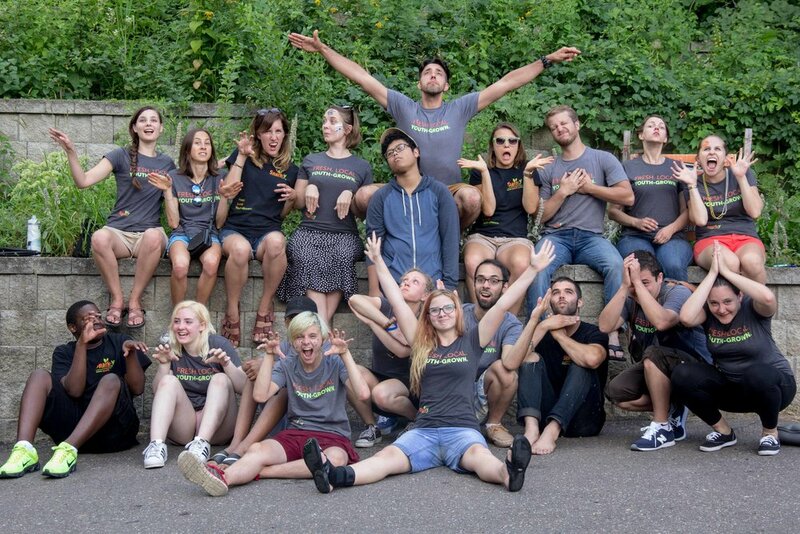 30+ youth from Spark-Y school programs and applicants from job placement programs, college graduates, and graduate students combine into teams to execute sustainable projects throughout the Twin Cities. Teams are led by second-year internship graduates, to create a culture of youth development and leadership. 2019, 9th Annual Summer Internship Application details below. Gain employment, entry to grad school, and admittance to special programs as a direct result of their experience. Achieve a competitive edge and resume builder with a Spark-Y certificate. Go on to create businesses or bring sustainable / entrepreneurial practices and thinking to their careers. Join Spark-Y for our 9th Annual Summer Internship! Are you passionate about creating positive and sustainable change in your community? Are you looking to build your resume and gain exposure to sustainability and green opportunities in the Twin Cities? Do you want to grow, learn, take risks, and meet like-minded young people? The Spark-Y Summer Internship offers an action-packed six week program that equips students and young professionals with experiences and tools necessary to succeed in today’s job market. APPLY NOW. You will work in small, dedicated teams to deliver on projects that improve sustainability in the Twin Cities. You will be mentored through an intensive training in professional development and skills for success. Teams will tackle real-world community projects funded through contracts with local businesses and partner organizations. As such, delivering high quality results is essential to intern success. At Spark-Y we provide a path for young people to create change in what they believe in. Our work here at Spark-Y yields economic and environmental results through the decisions and actions we make as individuals and as a group. Spark-Y is thrilled to welcome a passionate and inspired group of interns for the summer of 2019 so that we may all take action and create change together. Application consists of a resume with a cover letter. Please submit resume and cover letter. Your cover letter should highlight why you are interested in this opportunity, what prepares you to be a Spark-Y intern, and what you would bring to your internship team. "Spark-Y has given me the confidence to know that I can do this. I had never worked with power tools before, I knew nothing about timber framing, and I had never gone to meetings. Now I'm doing all of it. I have matured a ton being here." Greening neighborhoods: Spark-Y is expanding outdoors! Join us this summer and for the Casket Arts Building green space development. We will transform the building perimeter into a community sustainability hub with raised garden bed space, compost, and bee houses. 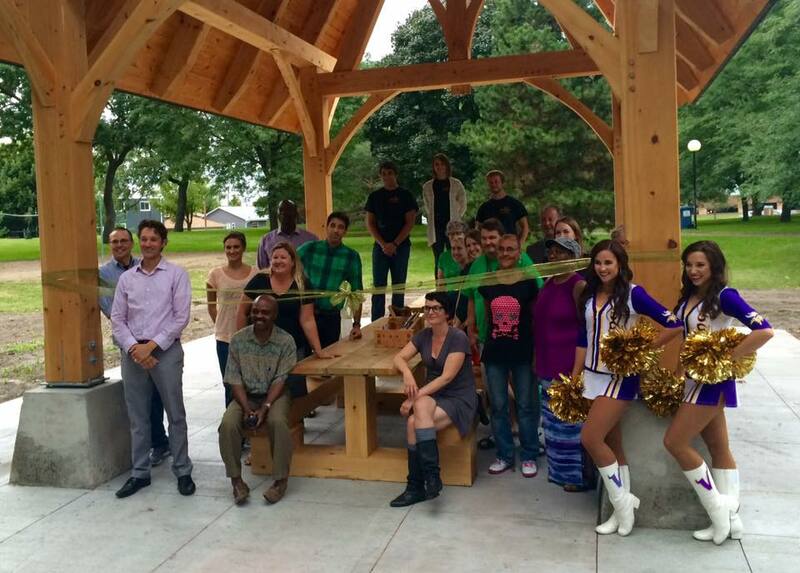 Come be a part of the action and convert Spark-Y into a Sustainability Hub of Northeast Minneapolis. Sustainability Education: How do you use your own passion to empower youth? The Columbia Heights Internship team will combine their sustainability perspectives to enact five action-packed weeks of fun at a middle school camp. Design activities, build hands-on curriculum, and engage with youth! Entrepreneurship: Become highly employable by managing projects on a deadline and budget. Sustainability: Designing our systems, economies, and environments so that they honor and support nature and take care of all our brothers and sisters. Sustainable jobs in Minneapolis: You will meet a network of Spark-Y partners and learn about all the opportunities for jobs related to sustainability in the Twin Cities area. Professional and job skills: Develop the undeniable skills that employers most look for: Leadership; Communication; Critical thinking; Teamwork; Problem solving. We will also explore project management, marketing, community events, motivation, integrity and attitude. DIY Bio: Further our mission by making biology accessible for everyone and developing/incubating new ideas. Sustainable agriculture and systems thinking - Spark-Y uses sustainable agricultural systems such as aquaponics, vermicomposting, mushroom cultivation, school farms and permaculture inspired rain gardens for engaging learning tools for youth of all ages. Learn what they are, how they work, and their place in the social, economic, and environmental fabric of our Minneapolis community. Spark-Y interns are held to a high degree of excellence. Tarryn Michelson - Collaborative Leader Award, Isabelle Paulsen - Collaborative Leader Award, Hamza Yusif, Isaac Groven, Hannah Wallace - Community Outreach Distinction, Sheila Sullivan, Aidan Cuoco, Amir Sheikhali, Miguel Garcia Rosales, Davon Washington, Michael Salzl, Natalie Dusek, Jahir Aquino Moran - Young Leader Award, Gabriel Cayetano, Andy Uvences Bonilla, Erin Boehme - Community Outreach Distinction, Shannon Van Dusartz - Collaborative Leader Award, Modou Dibba, Alejandra Diaz Torres, Salma Khalif, Peyton Thao, Nicholas Lockert - Above and Beyond Award, Megan Anderson, Abby Aasen, and Connor Solvang - Above and Beyond Award. Daniella Torres-Skendi, Ella Spurbeck, Evan Schumacher, Freya Hatch-Surisook, Maverick Oblikson, Max Doty - Community Outreach Distinction, Kelly Kidwell, Sarah Ziskin - Community Outreach Distinction & Young Leader Award, Simon Kluzak, Zaki Abdi, Anna Jentz - Community Outreach Distinction, Charles Kinnegerg - Community Outreach Distinction, Christian Herrera, Claire Hueg, Daijiro Yokota, Elise Hanson - Community Outreach Distinction, Erin Purvis, Holly Check - Community Outreach Distinction, Judy Anne De Veyra - Above and Beyond Award, Kristen Chalmers - Collaborative Leader Award, Luke Carlson, Madeline Reed, Minette Saulog - Community Outreach Distinction, Nicholas Jacob, Ojiugo Ojebe, Sarah Westcott, Taylor Schroeder - Community Outreach Distinction, and Wil Larson. Rachel Mazac - Community Leader & Dedication Distinction, Zackery Allison - Community Leader & Dedication Distinction, Makenna Short - Community Leader & Dedication Distinction, Justine Oesterle, Melisa Rodriguez - Resilience & Commitment Distinction, Conor Arneson, Dylan Martin - Community Leader & Dedication Distinction, Jenny Fischer, Bekah Kropp -Dedication & Commitment Distinction, Brandon Arneson, Krista Martinka, Megan Gillen, Erin Gustafson - Above & Beyond Distinction, Kristen Chalmers - Above & Beyond Distinction, Mána McBurnie, Georgia Powell, Theresa Hunt - Dedication & Leadership Distinction, Ryland Sorensen, Luke Carlson, Maya Toney, Tucker Nyhlen, Naveed Nezhad, Kelly Kidwell - Dedication & Leadership Distinction, Phong Mia, Julia Revier - Community Leader & Dedication Distinction, Stacie Graves, Morgan Lillie, Jacksin Rusnacko, Peter Biros, Jakari Walker - Dedication & Achievement Distinction, Adelaide Ravensborg - Above & Beyond Distinction, Kharli Johnson, and Zaki Abdi. Jack Wahlquist, Rachel M. Mazac, Caitlin Barnhart, Laura Hayes, Joe Lerro, Mose McLain, Will Scully, Minah Swason, Khoa Le, Andrew Bocher, Kajsa Beatty, Katie Lynn Goodin, Luke Fernandez, Maddie Bartholomew, Courtney Lehman, Kathleen Hobert, Arianna Benson, Drew Anderson, Rhiannon Dalrymple, Connor Williams, Phong Mai, Bryan Jones, Olivia Wilson, Elena Rosko, Jack Kellner, Kristin Skoog, Owen Geier, Sarah Jabar, Elizabeth Zalanga, Thomas Steinkamp, Mack Trotter, Rachel Lang, Abdifitah Farah, Maria Chiang, Sol Kaasan,Stacie Graves, Morgan Lillie, Nick Steckman, Jessica Sanders, Jess Bass, Sam Menzies, Alyssa Cocoran, Srah Kroening, Kasie Schultz, Megan Van Loh, Kirsten Roepke-Larsen, and Alia Oldenburg.